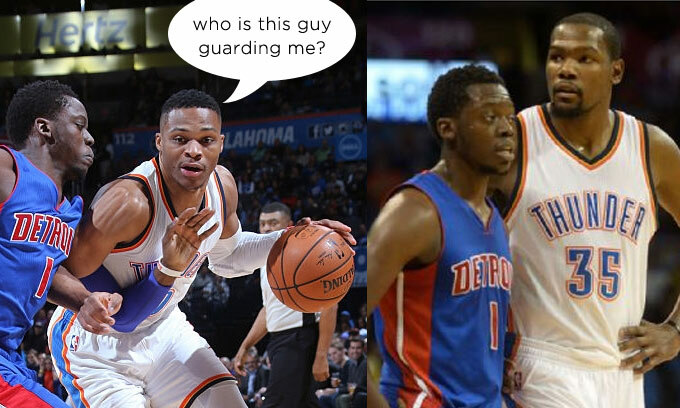 That one guy was Reggie Jackson who got his wish of being traded away since he wasn’t too fond of backing up Westbrook in OKC. On Friday, that guy made his return to OKC and was greeted by hometown boos as he struggled (4-16 fg) to hit a shot as his Pistons took a 16 point L.
After the game, that guy didn’t get much love from his former teammates either. A player who isn’t even a top 2 player on the Pistons according to Durant.